Ever since Ubisoft announced Beyond Good and Evil 2 in 2008, gamers have been dying to see what exactly Ubisoft was going to do with the franchise. It's been two years since then, and little has been discussed with the game, leaving many with anticipation. That's a major bummer, as not only was the original Beyond Good and Evil one of the most thematically original games released last console cycle, it was also smartly stylized and intensely beautiful. No wonder we named it number 6 in our top games of the decade. 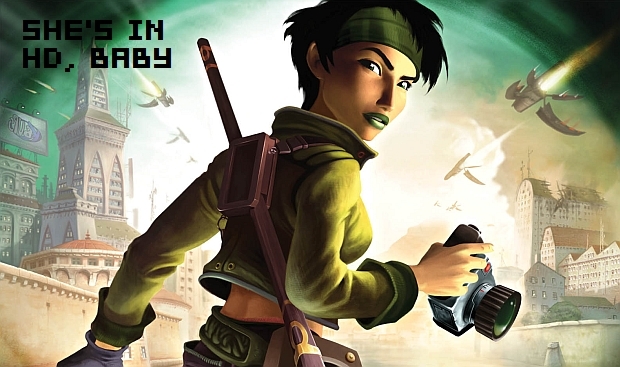 All is not lost, as this morning Ubisoft announced a brand new remake of the original Beyond Good and Evil. Technically, more of an HD port, as nothing new has been done with the game except boost the texture resolution and run it in full 1080p. This fact alone makes Beyond Good and Evil HD probably the best version of the game. We haven't got screenshots from the game just yet, but trust me, this game is hot. Having spent time with BG&E HD last night in downtown San Francisco, not only can I confirm that this is the BG&E that fans love, as it is absolutely gorgeous. True, it is the same title many of us played back in 2003, but the new visual overhaul takes this to the next level. Take a look at one of the original trailers, and you can see that an HD update is going to really kick things up a notch. Visually, very little would indicate that this is a last gen title, and the addition of leaderboards should keep things a little bit more interesting. Unfortunately, all is not well with the game, as there is currently some major frame rate issues. Thankfully, a 2011 release date means they have time to fix this problem. While it's not exactly BG&E 2, an HD update to a beloved classic is certainly nothing to sneeze at.